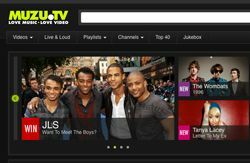 Sony adds MUZU.TV music video site to Bravia internet service | What Hi-Fi? Sony has added MUZU.TV, the music video site, to its Sony Entertainment Network of content for internet-enabled TVs, Blu-ray players and more. MUZU.TV has a portfolio of over 80,000 music videos, from the latest pop, rock and dance tracks to an archive of live performances, interviews and backstage footage. Any internet-enabled Sony device, from Bravia TVs, to Blu-ray players, to home cinema systems and network media players, will be able to access the service. MUZU.TV, which launched in July 2008, is free to use and claims to offer "the world's largest official catalogue of music videos".